B'resheet/Genesis 29:18 "I will serve you seven years for Rachel, your younger daughter"
Rashi points out how specific Ya'akov is being here: not just 'Rachel', for Lavan might buy another girl called Rachel from the marketplace; not just 'your daughter' for Lavan might (and, as it happened, did) marry Ya'akov to another daughter; but also 'your younger' so that there should be no doubt about the contract they were agreeing. All this, of course, was to no avail since Lavan does marry Leah to Ya'akov first and then extracts another seven years' work from his nephew for Rachel. And because of his love for Rachel, Ya'akov submits. Sforno, on the other hand, suggests that the seven years of labour that Ya'akov did before marrying was both a means of demonstrating his ability to properly provide for a wife and family, as well as a dowry for Lavan. When Ya'akov arrived in Haran, he later confessed, he had only the clothes he stood up in: "For with my staff I crossed the Yarden" (B'resheet 32:11), and the Sages said, "A man may marry many wives provided he possesses the means to support them" (b. Yevamot 68a). That aside, the text goes on to tell us that "Ya'akov worked seven years for Rachel and they seemed to him a few days because of his love for her" (v20). Was this just infatuation or did Ya'akov see some essential quality in Rachel that he knew marked her out as a woman of worth? Seven years is a long time by anyone's counting, yet Ya'akov not only ended up working seven but fourteen years for Rachel. He knew that he had to marry her, so he gritted his teeth and worked in spite of his uncle's duplicity. The writer to the Hebrews tells us that Yeshua "for the joy set before Him endured the cross, despising the shame and has sat down at the right hand of the throne of G-d" (Hebrews 12:2, NASB). Yeshua went ahead and pushed on through the physical and spiritual agony of the cross, His humiliation at the hands of both the Romans and the Jewish leaders of His day and the separation from His Father, in order to reach the prize set before Him: the victory over sin and death, the resurrection, the outpouring of the Spirit and the bringing of many sons to glory. This is why the gospel writer tells us that, "As the time approached for Him to be taken into heaven, He made His decision to set out for Jerusalem" (Luke 9:51, CJB); He knew what had to be done; He knew that only He could do it; He knew that the time had come and "He humbled Himself becoming obedient to the point of death, even to death on a cross" (Philippians 2:8, NASB). 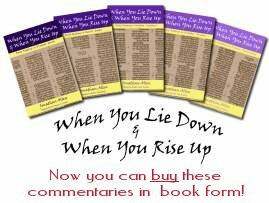 In the older and more literal translations of the Bible, Luke's words present an even more graphic picture of Yeshua's determination: "When the time came ... He steadfastly set His face to go to Jerusalem" (KJV). Application: What is our level of commitment to obedience to G-d's word, particularly when it becomes inconvenient or unpleasant? Should we not, as Rav Sha'ul says, "have the same mind in you was in Messiah Yeshua" (Philippians 2:5) and serve G-d both obediently and willingly?